This is an overview of the basic eco printing process. While silk doesn't require mordants for many things, it is fun to experiment with them. 1. The plant materials are laid out on the silk. Get everything as flat as possible in order to get the best prints. 2. 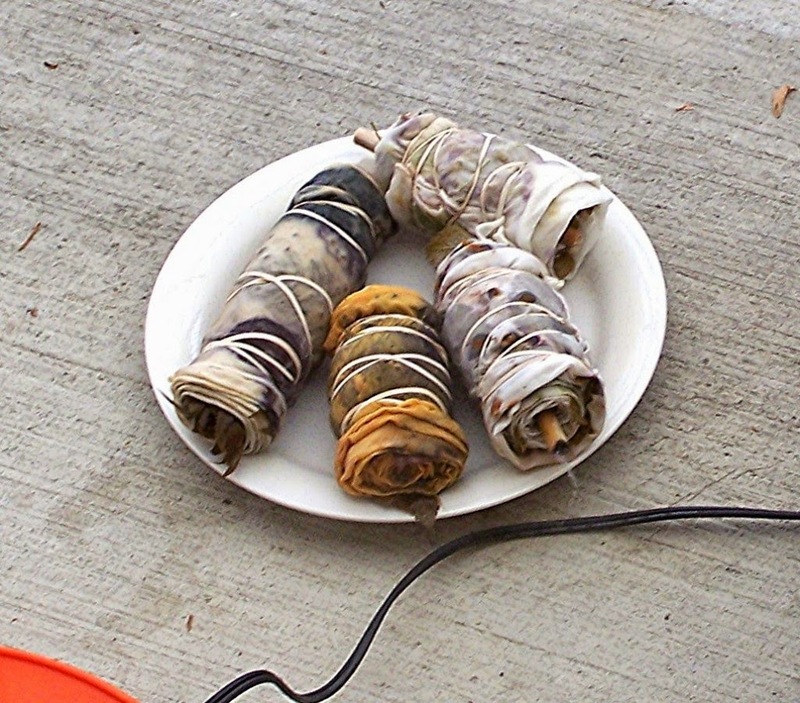 Tightly roll or bundle the fabric and bind with string or rubber bands. 3. Steam for about an hour. Keep an eye on the amount of water in the bottom, you don't want it to boil dry! 4. Remove the bundles from the pot and allow to cure for 3-5 days or until almost dry. 5. Unroll and take a look at your results! You may wish to let them sit around further; but at this point they can be rinsed out with mild soap and cold water in the sink, a quick ironing and they are ready to wear! Thank you for this! Some 'recipes' I've seen call for spritzing the fabric with vinegar water, or dipping the plant matter therein (or in iron water) before placing it on the fabric. Your opinion of that? Yes, mordants are a lot of fun to experiment with. Iron and rust make most things come out darker, copper and aluminum tend to be lighter. The safest and simplest way to do this is to "cook" your piece of silk in a pot made out of the metal you want to try (remember that copper cook pots are lined, so you have to use a piece of pipe or other copper object in an enamel pot to achieve results). 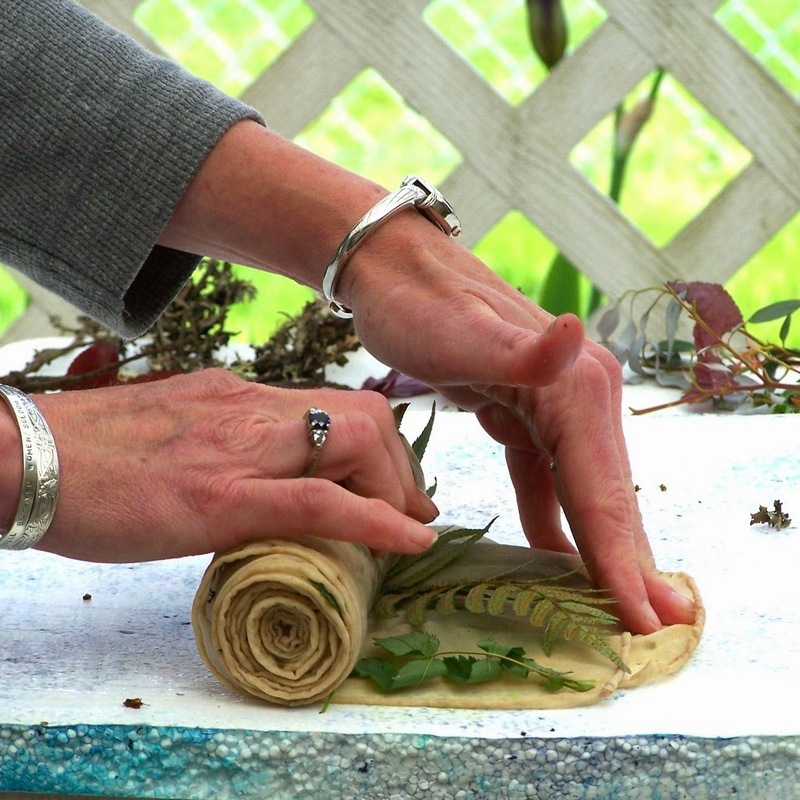 After it has simmered a bit, take it out and then lay out your leaves, roll it up and steam it. A great resource for this sort of thing is India Flint's book Eco Color, she writes at length about mordants and the pros and cons of many. Vinegar is an acid and also can affect, or "shift" colors. Thank you for sharing this information. Also for the recommending the book. You are welcome! I plan to do a post soon about other books I have found helpful, keep an eye out for it! Hello Nan, beautiful work! Do you pre-treat the silk and fabric? Thank you for your kind words Martina! Yes, I experiment with mordants, before during and after steaming. 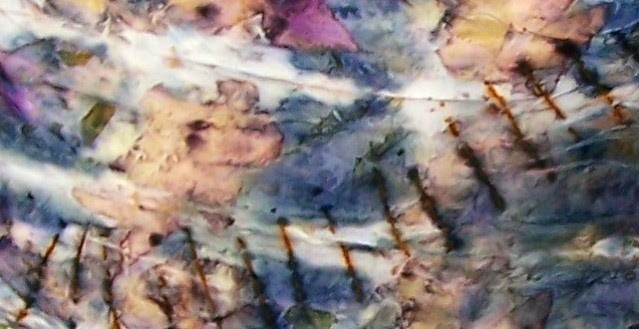 The silk in the pictures was mostly done with rusted nails. That is, I laid it out and left some nails on it for about 6-8 hours and washed in salt water, then did the steam printing. While not exactly archival, it does make some beautiful colors. I also use the "pot as mordant" method and things like alum and vinegar. I'm new to this process and your blog is of great help. Thanks! Hi Denise! I have worked with a limited amount of linen. I followed the mordant procedure for cellulose fibers in India Flint's book Eco Colour page 104. I pretreated the linen with alum, then soy milk and went back and forth several times and then let the fabric set around for several months. I also did lay out some rusty objects on the fabric and then steam printed with leaves and it came out well and the color held. If you didn't want the rust marks you probably could get the same results by boiling the linen in an iron pot before you did your eco printing. I would highly recommend steaming the rolls over boiling water as pictured above, I am not sure oven heat is intense enough to get good results, at least I have never tried it anyway. Good luck! That is a complicated question, as many plants work at some time of the year and not others. I do collect and press leaves in the fall to use in the future. The best way to find out what works is to experiment on small pieces of fabric, then let it set around for a bit and see if it changes from sun exposure or washing. Adding to the challenge is that some things work with some pre or co-mordants and some do not. Since your project was using eucalyptus, I would go ahead and try steaming it and see what you get, some of my best things started out as stuff I thought was a total loss. Don't see these as failure, but as a learning opportunity, if nothing else you learned what not to do! Your questions have inspired future blog posts, which is great as we just got our first snow and I was hard pressed as to what to write about when there are no plants outside. You can now subscribe to the blog by email on the home page, in addition to being able to follow it publicly or privately. The post for May 12th 2015 includes a list of books you might find helpful as many of them do talk about mordants for various fibers and fabrics. Thanks for all the great questions! Unfortunately I had to buy Alum at the supermarket Today. what is the proportion of Alum to weight of fabric and how long should I soak cotton and silk in the alum bath? Hello! First off, alum from the grocery is not to my understanding the same thing used in dyeing. Alum is a common term for anything containing aluminum. That being said, it can't hurt to experiment with it. I only work with silk so can't really answer your question regarding cotton. Silk is a protein fiber and cotton is from a plant and they are treated very differently in order to hold color. I highly recommend reading India Flint's Eco Color and Jenny Dean's Wild color for two really great discussions on the use of mordants with different fibers. 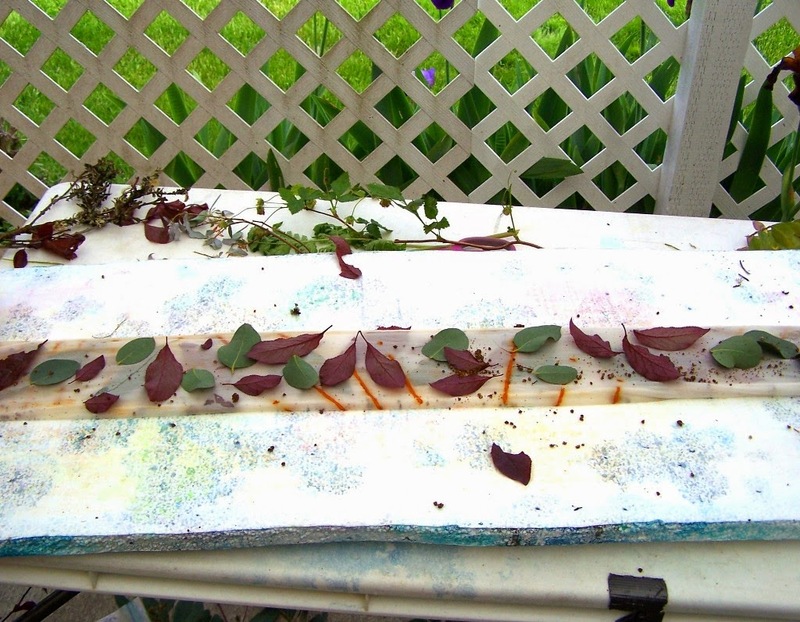 My basic method for a pre-morndant on silk with alum is to dissolve a scant tablespoon in about a gallon and half of hot water, let several scarves soak in it until the water is cool and then rinse them out and they are ready for eco printing. Is it important to rinse the alum out before you eco dye the silk? Hi Kathy!The basic way to apply a powdered mordant is to disolve it in simmering water,soak the silk in it for an hour and then remove the silk from the water, rinse and let dry. You want to rinse out any extra mordant that is not bonded to the fabric. Otherwise, the color will stick to the mordant and not bond to your fiber or fabric and wash away the first time the item is washed. Good to know. Thank you so much. 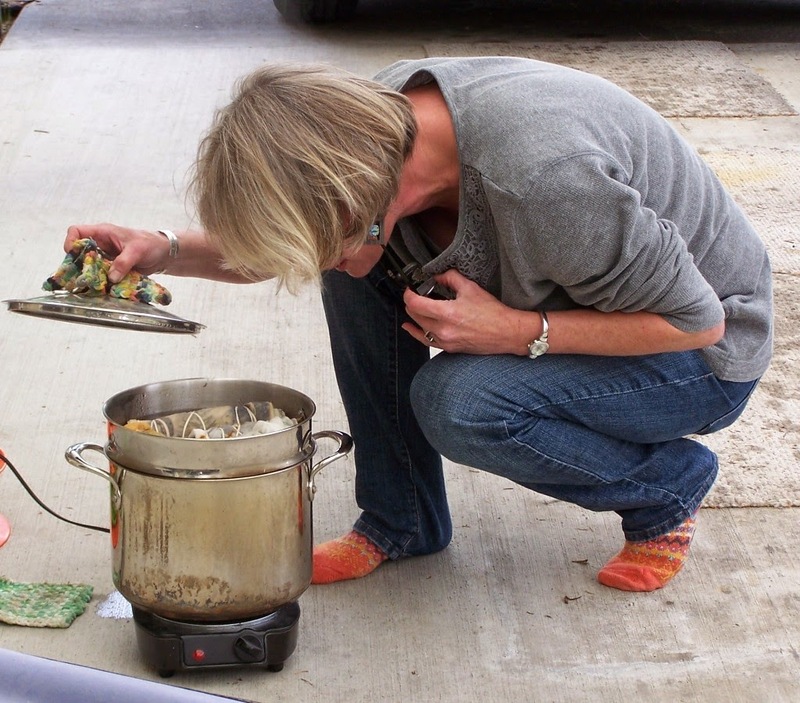 where do you find the steamer pot that you used in the demonstration? That one in particular came from some place like Target I think, but I do find them at thrift stores occasionally. Basically it is a stew pot with two steam baskets plus lid, one deep basket for pasta and a short one for veggies. I take the long one out and just use the stew pot with the veggie basket. The pot holds about an hour's worth of water in it, so less babysitting. I got one at a thrift store that was IKEA brand, so you might want to check out their website.